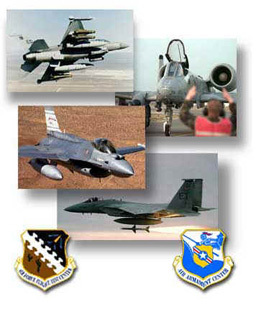 Instrumentation support at Edwards AFB, California, supporting the operation and sustainment of recording and telemetry systems used on aircraft in all of the Combined Test Force: F-35, F-22, F-16, RQ-4, C-17, C-130, KC-135, KC-10, KC-46, B-1, B 2, and B-52. Program management support for the F-35/Joint Strike Fighter Joint Program Office in Crystal City, Virginia, where ATAC personnel provide crucial support for the management of flight test, simulator design, training system requirements’ definition, and safety engineering for the largest-ever tactical aircraft acquisition program in the US DoD. Store certification at Eglin AFB supporting the Air Force SEEK EAGLE Office, developing modeling tools to enable evaluations of aircraft handling qualities, store separations, flutter, and loads on aircraft including F-15, F-16, B-1, B-52, B-2, and new aircraft designs. Test Engineering support at Edwards AFB supporting multiple Combined Test Forces in the planning, execution, and reporting of ground and flight test programs, including the Global Hawk, KC-46, F-35, F-22, F-16, CV-22, and other aircraft. ATAC test engineering and test data analysis expertise cuts across platforms, services, and ranges to make industry best practices and lessons learned available to help each new program succeed on-time and on-cost.